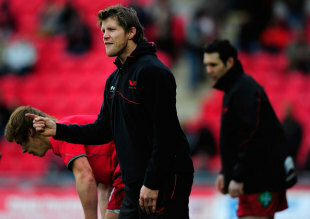 Scarlets coach Simon Easterby has been linked with the vacant Ireland forwards coach post. John Plumtree held the role during their triumphant Six Nations campaign but left in June to take up a role with the Hurricanes. With Les Kiss now in temporary control of Ulster following Mark Anscombe's departure, Ireland boss Joe Schmidt will be looking to bolster his backroom staff and reports in the Irish Independent have linked Easterby with a potential switch. If the move comes off, it is not clear whether Easterby will combine club and country duties but he would bring a wealth of experience to the forwards coach post having won 65 caps for Ireland.